Citizen is proud to present its Limited Edition Red Arrows Skyhawk A.T timepiece. The Red Arrows Skyhawk A.T keeps incredibly precise time, thanks to its Radio-Controlled Atomic Clock Synchronisation Technology. By connecting to the Atomic Clock via radio waves the exact time is directly transmitted to this Limited Edition. It has a pilot’s rotating slide rule dial ring, perpetual calendar and a world-timer. Additional features include 1/100 second chronograph measuring up to 24hrs, 2 alarms, a 99 minute countdown timer, dual time, power reserve indicator, digital display light, sapphire crystal with anti-reflective coating, and water resistant to 200m. This is powered by Citizen’s Eco-Drive technology that uses light so never needs a battery change. The RAF Red Arrows Limited Edition insignia is engraved on the case back whilst its official logo appears on the dial. Limited to 1/9999 Pieces Worldwide and presented in a Limited Edition Presentation Box. 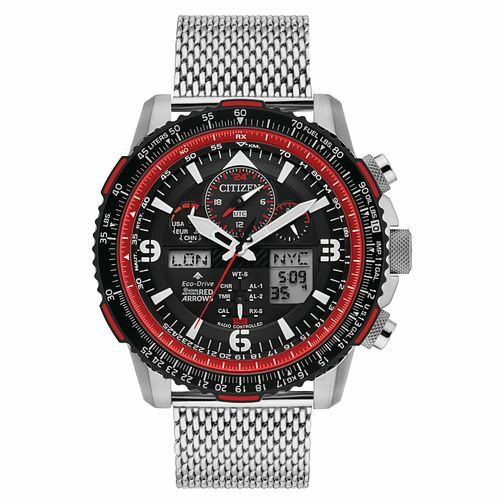 Citizen Red Arrows Promaster Skyhawk Men's Bracelet Watch is rated 5.0 out of 5 by 4. Rated 5 out of 5 by Anonymous from This watch is stunning Bought this for my husband,he absolutely loves it.Amazing detail and very stylish.It needed links taking out,so called into H SAMUEL,and they took the links out while he waited and made sure he was happy with the fit.